Click trailer at the top to view the preview trailer for Tumor! It was created by Jerry Pyle, featuring music by Jerry and myself, and the voice talents of Mr. Glen Creason, Mr. Eric Reid, Mrs. Christina Rice Fialkov, and yours truly. A little later on I’ll put up a quick note from Jerry about the creative process of cutting the trailer! Enjoy! 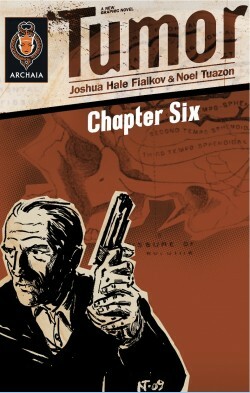 My name is Joshua Hale Fialkov, and I’m the writer and co-creator of the new Archaia graphic novel, TUMOR. This is my second collaboration with artist Noel Tuazon, after our graphic novel, Elk’s Run. We’ve been developing Tumor in one version or another since we completed that book back in 2007. I’m immensely proud of the work, and am looking forward to sharing it with all of you. Over the next several months, this blog will providing you a behind the scenes look at the work that goes into making a graphic novel. I plan on uploading full versions of each script upon the release of each issue, as well as concept art, interviews with the rest of the creative team, and an interactive experience that will hopefully enhance the experience of reading TUMOR. Please feel free to suggest features and let us know what you think of the book and this site. Thanks again for taking the time to check out our work, and I can’t wait to get started!